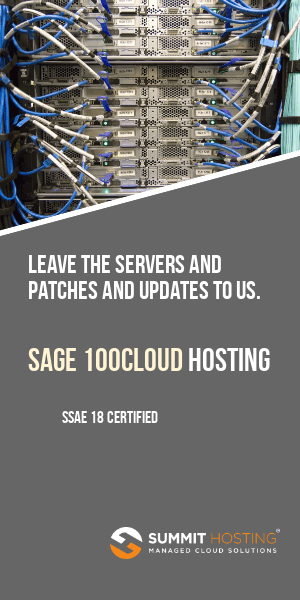 The Sage 100 ERP LinkedIn discussion group is an independent forum for the discussion of all things related to Sage 100 ERP (formerly Sage ERP MAS 90 and MAS 200). We founded this group in January 2009 and in three years it has grown to almost 2,000 members. The group is not sponsored by Sage though from time to time official Sage representatives participate in the discussions. As of August 31, 2012 the membership is 1,999. Will you be #2,000? 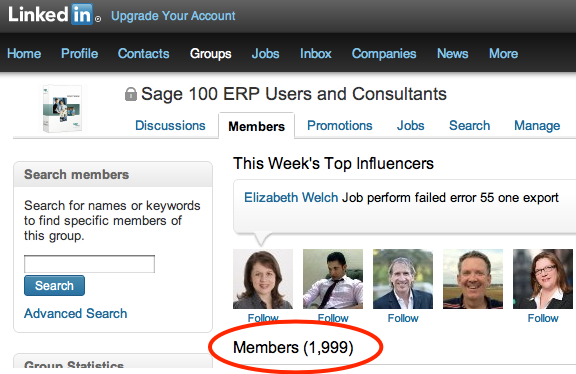 Membership in the MAS90 LinkedIn Users And Consultants Group today topped 1,000 members for the first time. 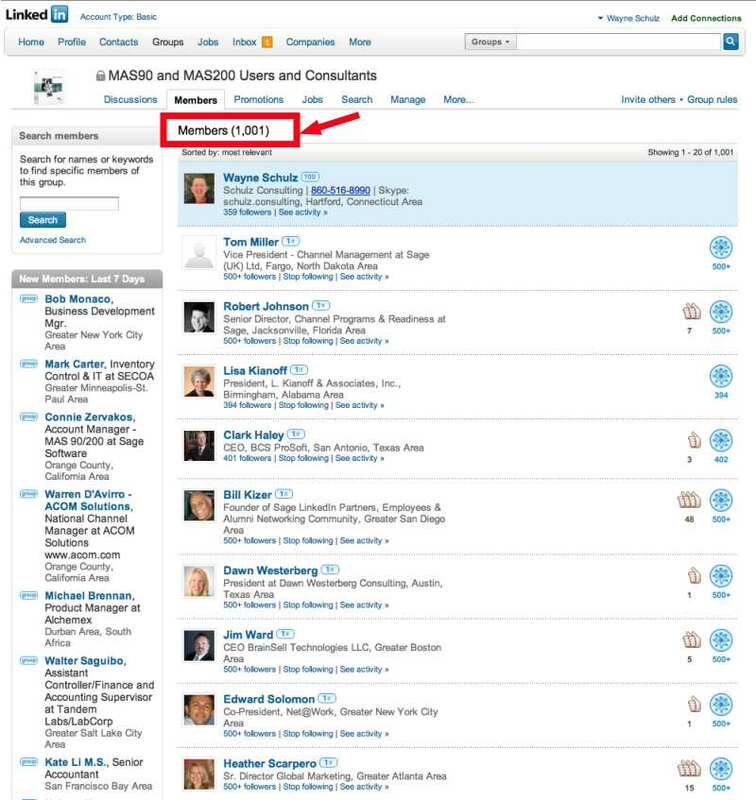 Formed in January 2009, the Linkedin group is approximately 10 times larger than the largest next MAS 90 specific discussion group on Linkedin and is not sponsored by Sage. Participants regularly share information and the latest news about Sage ERP MAS 90 and MAS 200 and informally discuss product ideas with Sage product managers. Membership is free and open to any MAS 90 or MAS 200 software users or consultants. The only requirement is to participate and share knowledge. Bill Kizer has just posted a great set of tips for better utilizing LinkedIN and more importantly how to make money from your participation. Most important of his advice is to keep everything updated, use a profile photo, participate in discussions and make connections. This 14 minute presentation is part of a discussion he facilitated at a recent group meeting. Bill went back and recorded the presentation for the benefit of all who may have questions about using LinkedIN. Did you know that Sage has an online community where both consultants and end users can ask questions, share answers and mingle? If you haven’t checked it out – you should register for a free login name. You do not have to be a Sage ERP MAS 90 or MAS 200 user to obtain a name. Some of the brightest minds — both users and consultants — regularly visit to ask and answer technical questions. One link that I have saved on my toolbar is below. When clicked it will take you directly to a list of new messages posted for the day – no login is required. 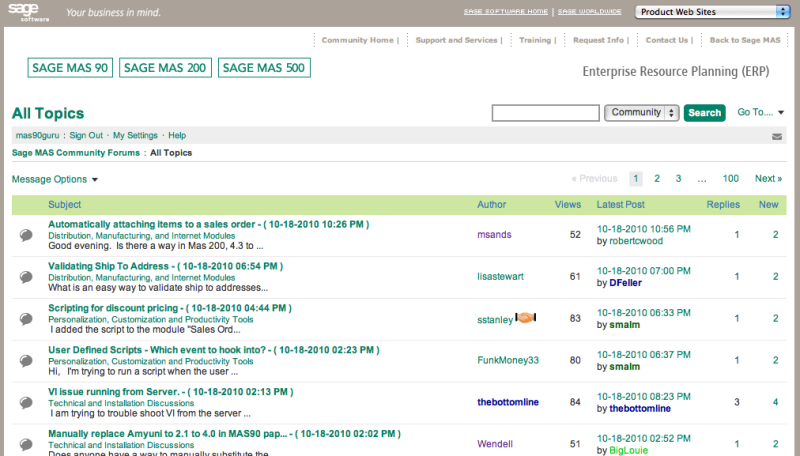 It’s an easy way to keep an eye on what users are talking about with regards to a new Sage ERP MAS 90 or MAS 200 release. If you use an RSS reader you can even connect to the site via this link (rss feed) so that can view new topics in your favorite RSS reader (I recommend Google Reader). 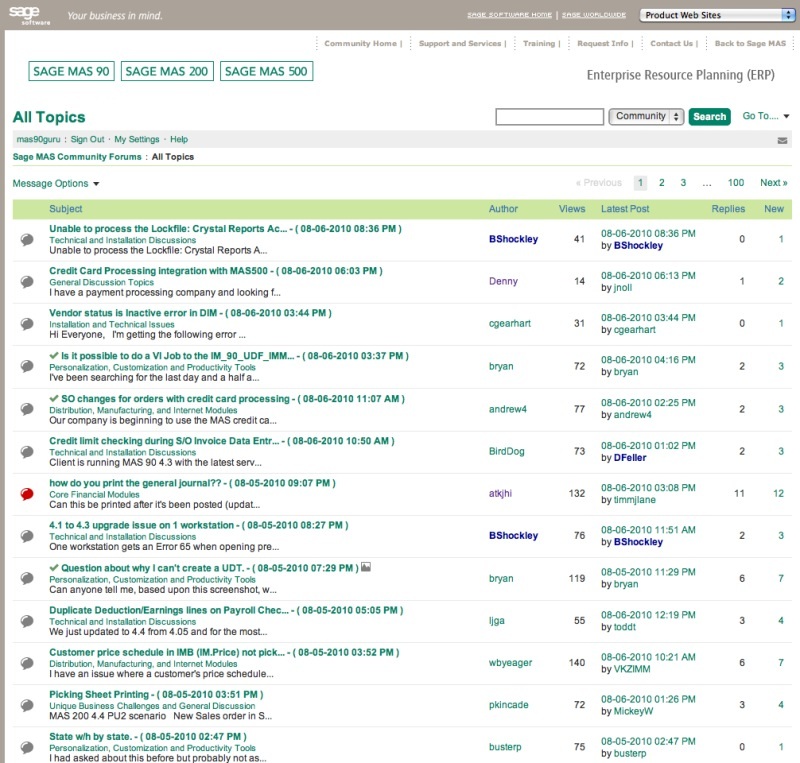 Did you know that Sage has a community forum where users and consultants gather to discuss the burning issues of the day as it relates to Sage MAS 90 and MAS 200? Participation is free — and you can always view a list of all the new messages (in chronological order) via this Sage MAS90 Community Link. That link works great provided you remember to check it regularly and review the new messages. But if you’re prone to forgetting (like I am) then you might want a more automated way to receive notifications of new messages. I’ve just created a feed of these new messages on Feedburner which is an automated RSS delivery system. Use the form below to subscribe by email — and you’ll receive a mailed notification of each topic as people post online. Say goodbye to remembering to manually check the discussion area for new information. Now all you’ll need to check is your email inbox. The feeds are managed by Google’s Feedburner service — and you can decide to stop receiving these updates at any time.